Krasnoyarsk is located near the midway point on the Trans-Siberian Railroad between Moscow and Vladivostok and is an ideal city to stop in if you’re travelling overland across the country. Russia’s 10-rouble banknote features images of a hydroelectric dam and railway bridge from the city of Krasnoyarsk in eastern Siberia. Although more well-known sights, like Moscow’s Bolshoi Theatre, adorn other Russian bills, the 10-ruble note hints at the fact that Krasnoyarsk is one of Siberia’s most thriving urban centres. Founded as a military outpost in 1628 by a band of Cossacks, Krasnoyarsk quickly became a thriving river port and key transit point for the region’s mining industry which produces the majority of Russia’s nickel, cobalt, and copper. Krasnoyarsk flourished when the Trans-Siberian Railroad arrived here in 1895. One year later, the Krasnoyarsk Bridge was built over the Yenisei, providing rail access to far eastern Russia. The bridge was heralded as an engineering marvel and still appears on Russia’s 10-ruble bill. Krasnoyarsk became a major industrial centre during the Soviet era and its population soon grew larger than nearby Irkutsk. During the Second World War, factories were relocated from Western Russia to Krasnoyarsk and other nearby Siberian cities which jumpstarted the local economies. Construction of the Krasnoyarsk Hydroelectric Dam, located 40 kilometres up the Yenisei in Divnogorsk, was begun in 1962. Today, the dam produces 6 million kilowatts of energy and is one of the largest of its kind in the world. 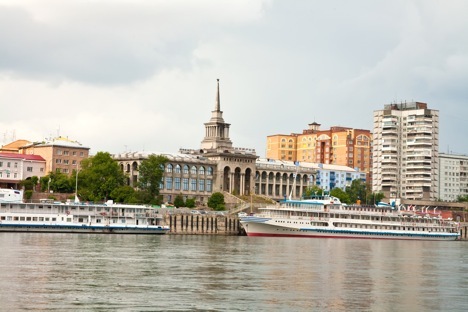 Roundtrip flights run daily between Moscow and Krasnoyarsk ($420-500). From Novosibirsk in the east, 8-10 trains leave for Krasnoyarsk each day in the afternoon and late evening (12-13 hours, $60-120). From the west, 5-7 trains leave Irkutsk throughout the day and night (17-18 hours, $45-250). A number of famous Russians have passed through Krasnoyarsk. Russian playwright and author, Anton Chekhov, known for his dislike of most Siberian cities, referred to Krasnoyarsk as the most beautiful city in Siberia. Vladimir Lenin was exiled to Siberia for three years at the end of the 19th century for revolutionary activities. Lenin was sent to Shushenskoye, a village on the Yenisei River, but he spent several months in Krasnoyarsk on the way where he began work on his book, The Development of Capitalism in Russia , which he finished while in Siberia. One of Russia’s most well-known painters Vasily Surikov was born in Krasnoyarsk. Surikov is best-known for his large paintings of key moments in Russian history, including ‘Conquest of Siberia by Yermak’ which documents the famous Cossack leader battling with Siberian Tatars at the end of the 16th century as Russia slowly expanded into Siberia. Krasnoyarsk is located near the midway point on the Trans-Siberian Railroad between Moscow and Vladivostok. It’s an ideal city to stop in if you’re travelling overland across Russia, and there’s more than enough to keep you occupied for several days. The Hotel Krasnoyarsk (94 Ul. Uritskogo) in the city center has English-speaking staff, a restaurant, and a massage parlor on site. Rooms start at $120. Start a walking tour of Krasnoyarsk on the city’s main drag Prospekt Mira. This pleasant avenue has a plenitude of shops, restaurants, and several nearby churches completed around the turn of the 19th century, including the Resurrection Church (9 Ul. Yanvarya) and the Intercession Cathedral on the corner of Ul. Mira and Ul. Surikova. Close to Pr. Mira are two museums dedicated to painter Vasily Surikov arguably Krasnoyarsk’s most famous resident. The Surikov Art Museum (20 Ul. Parizhskoy Kommuny) contains 78 of Surikov’s paintings. The nearby Surikov House-Museum (98 Ul. Lenina) is located on the estate of the Russian historical painter and features the wooden house where Surikov lived as well as the family’s barn and vegetable garden. Inside you can view Surikov’s personal belongings and 100 of his works. South of Pr. Mira is the Krasnoyarsk Regional Museum (84 Ul. Dubrovinskogo), often touted as one of Siberia’s best museums. Housed in a century-old building with an Egyptian theme, the museum contains exhibits on the native people who lived along the Yenisei River, the flora of eastern Siberia, and the Cossack explorers who arrived in the region over four centuries ago. There’s also a mammoth skeleton and an exhibit dedicated to the Tunguska explosion—the largest recorded impact on earth which occurred when a giant asteroid hit northern Krasnoyarsk Krai in 1908. One of Krasnoyarsk’s quirkiest sights is the St. Nikolai, the small steamship which brought Lenin from Krasnoyarsk to Shushenskoye. The ship is docked on the Yenisei, just south of the eastern end of Pr. Mira, and has a small museum inside. East of the St. Nikolai, there’s a small river terminal where hydrofoils travel upriver to the Divnogorsk hydroelectric dam in summer. It’s a great way to get out on the water and see one of Russia’s most important Soviet works projects. The local outfit SibTourGuide offers its signature ‘10-Ruble Tour’ where travelers can visit each of the sights featured on the 10-rouble bill, including the dam in Divnogorsk. Just twenty minutes from central Krasnoyarsk lies the Stolby Nature Reserve , a forested park that features finger-like volcanic pillars. You can go hiking or rock climbing in the park or just stretch your legs after a long ride on the Trans-Siberian Railroad. The tour company Sayan Ring offers guided ours of the reserve in English ($40-100 per person depending on group size and length). Below the park you’ll find the Bobrovy Log Ski Resort where you can hit the slopes during the colder months. The Krasnoyarsk territory spans from just north of Mongolia to the Arctic Ocean and is Russia’s second largest province. Sayan Ring can help you start exploring this vast part of Siberia through week-long bicycle tours, 10-day motorcycle trips, and a 9-day river cruise along the Yenisei.